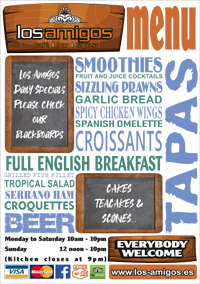 'Los Amigos' is a local, independent business that was borne of a love for Canarian food & culture. Having spent great times with friends enjoying different restaurants and tapas bars on Lanzarote inspired the tapas theme for our fabulous venue at Playa Bastian. 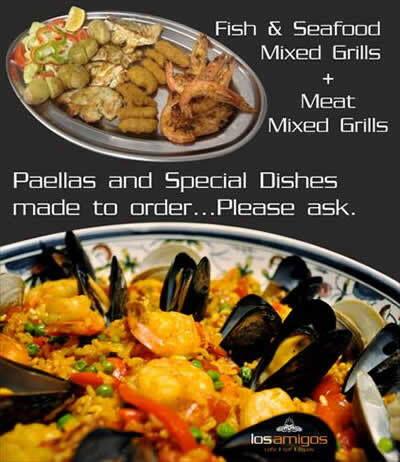 We have a full tapas Menu and Specials Boards which frequently change, as there is so much that we would like to put onto the menu, but cannot fit on there! We also provide breakfasts, coffee and cakes, a selection of teas and infusions as well as local ice cold beers. Los Amigos supports local suppliers for our fresh meat, fish & vegetables and can cater for a wide variety of dietary requirements. There is a good selection of vegetarian dishes on the menu, and we can also offer alternative dishes if required. If you can let us know in advance if you or someone in your party has any allergies, we will do everything we can to prepare food just for you. Los Amigos also offers an array of Spanish inspired cocktails, beers and spirits, as well as as local and international wines. We also offer flavoured Frapelattes, Milkshakes and selection of Ices and Ice Creams, ideal for chilling in the midday sun! 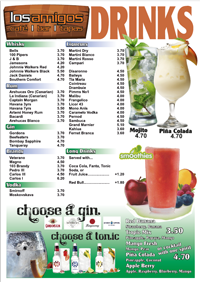 Click on the image below to open the Los Amigos Drinks Menu, new for 2019!